Libraries ACT is inviting the Canberra community to visit their local library over winter and discover the new ‘what’s on’ winter program. Penny Davies, the senior manager for content and engagement at Libraries ACT, said there were several free programs for all ages at local libraries, with a new program just launched for the colder months of the year. A full day of free and educational activities is planned for Saturday (11 June) at the Civic Library, she said. “The Makerspace Open Day from 11 am until 4pm will be a chance for all ages to see how creativity meets science with 3D printer demonstrations and a lego mindstorm robot in action. “There will also be fascinating talks held throughout the day, with guest speakers, including Glen Nagle from the local NASA Deep Space Communication Complex, and local artist Blaide Lallemand. 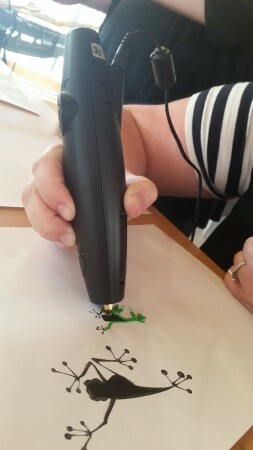 “Children will be entertained with exciting hands-on activities including using 3Doodler pens (pictured), which draw in 3D, to make something special to take home. “Libraries ACT will host a range of other free activities during the winter program. These include ways to keep you healthy, keep up to date with technology on smart phones and cloud storage, improve the look of your home garden with tips over winter and get some lunchtime legal advice regarding wills, dealing with neighbourhood disputes and what to do if involved in a motor vehicle accident. “There are also family programs that include a Dr Who trivia lunchtime quiz, a Harry Potter night and the opportunity to build amazing lego creations with the brick club. “Come in from the cold at any of the nine branches to experience what your local library has to offer. You will be surprised if you haven’t been inside for some time. Libraries have evolved to match people’s reading and lifestyle habits. All programs are free and some require bookings. Love to read and visit the library and would enjoy participating in some activities. However, the students at the college adjoining Gungahlin library often make it an unpleasant experience. The behaviour of the students is disgraceful inside and outside the library. Obviously they have little respect for other people’s rights. The library is also often filled with extremely noisy children running and screaming while their parents stand around talking. Certainly a different type of library. Perhaps it is worth lodging a complaint with the school? If the behaviour is occurring in the public library, they might not be aware of it.